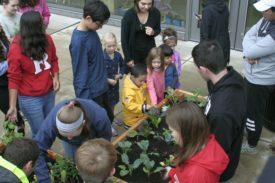 Share the post "Byrne Seminar Students Build Schoolyard Teaching Garden for IFNH Nursery School"
IFNH Nursery School students. Photo: Jennifer Simon. 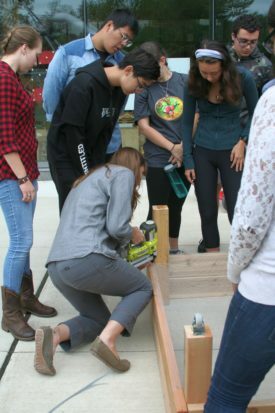 Byrne Seminar students building the raised beds with instructor Ariana Lindberg using the staple gun. Photo: Jennifer Simon. 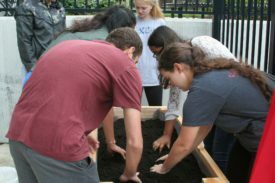 Twenty Rutgers students from the Byrne Seminar, “Building a Schoolyard Garden,” created the first living laboratory on the George H. Cook campus that is dedicated to the preschoolers in the Culture of Health Academy, a nursery school located on the ground floor of the Institute for Food, Nutrition and Health (IFNH). The academy, which operates as a partnership between the Center for Childhood Nutrition Education and Research at IFNH and the Rutgers Psychology Child Development Center is a focal point of the New Jersey Healthy Kids Initiative, a program launched earlier this year to achieve health equity for all children. 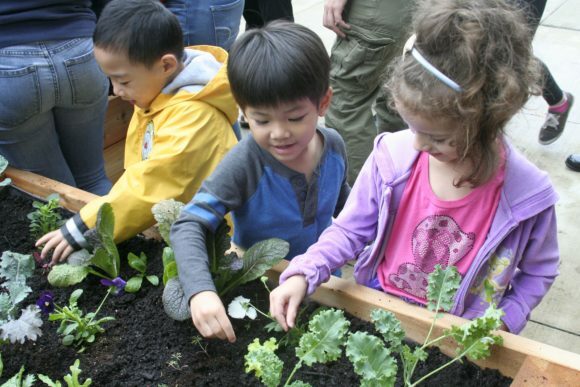 Building a schoolyard vegetable garden in a corner of the playground was a perfect complement to the nursery school’s 2018 curriculum, which is devoted to nutrition-based programs and healthy eating. Associate professor Holly Nelson and instructor Ariana Lindberg, both of the Department of Landscape Architecture, led this particular Byrne Seminar—a one-credit course designed to introduce first-year students at Rutgers-New Brunswick to academic life. Limited to 20 students, participants get to experience the excitement of original research as faculty members share their curiosity, their intellectual passion and how they develop new ideas and fields of knowledge. A major component of this project was planning and problem solving. Students had to consider the layout of the beds and how to plant the plants. They also had to make sure all the edges were safe for little fingers. “When one of the planters broke, we reinforced the bottom with stronger wood to ensure it wouldn’t break again,” said Emily Brzozowski. Seminar students also read and discussed excerpts from Richard Louv’s Last Child in the Woods and worked in teams to develop pre-school level lesson plans centered around gardening and sensory exploration. 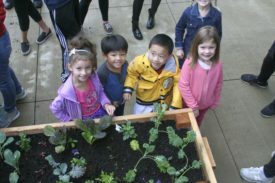 Other lesson plans included a board game for learning colors and vegetables; Vegetable Superheroes, an exploration of nutrition through vegetable superpowers and From Seedling to Salad, a look at the growth stages of plants. Byrne Seminar students and nursery school students inspecting the finished raised beds. Photo: Jennifer Simon. Each year the Byrne Program explores a particular theme through more than 140 seminar offerings. In 2018-2019, the Byrne Program explores the theme, Diversity of Methodologies/Methodologies of Diversity, suggesting both the boundless possibilities of academic inquiry, and new and innovative ways professors teach and students learn.